Based in Ashford, we offer homeowners and businesses across Kent, the South East and London the very best in house, office and school removals. Established in 1941, we’ve brought the highest standards in moving house and office removals services for over 75 years. Offering unrivalled experience and expertise, we help people and businesses from across Kent and London move to anywhere in the UK and Europe. While we are one of the largest removals firms in the South East, we are still a family run business and offer the traditional values you would come to expect; customer orientated services, competitive prices and dedicated teams of relocation experts that put you first. One of the main reasons why we are at the top of our industry is the dedication, expertise and experience of our team. Highly trained and fully qualified, they treat your possessions with absolute respect and are proven to get items and possessions to the required destination safely and on time. We have a full fleet of vans and different sized trucks so we can cater for any awkward access places and offer a very large and secure storage facility to safely store goods, no matter what your circumstances. Our storage warehouse is dry and highly secure, with CCTV, alarms and a specialist team trained in fork lifting, warehousing and general health and safety ensuring everything runs as smoothly as our removals. Testimony to the quality of our work is the fact that we are recommended by over 98% of our customers. For more information, please visit either the Referenceline website or our Testimonials page. For your added assurance, we are also members of the British Association of Movers and European organisation Fedimac, as well as being recognised and accredited by the Office of Fair Trading. Based in Ashford, we provide comprehensive removals services to homeowners, schools and commercial businesses across Kent and the South East. 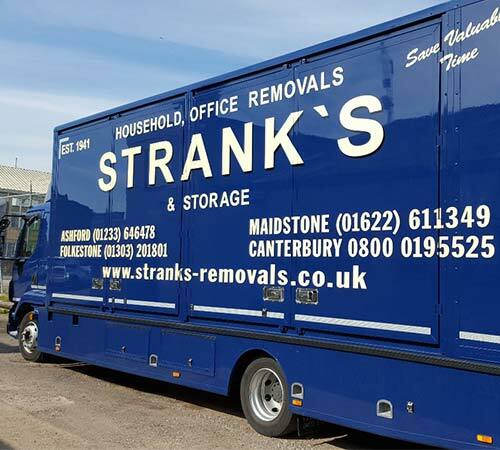 We have helped customers relocate from Folkestone, Canterbury, Tenterden, Romney Marsh, New Romney, Lenham, Ashford, Staplehurst, Kingsnorth, Chartham, Barham and Charing. For further details of our removals services, please visit the House Removals and Commercial pages of this website. Of course, we also welcome enquiries at any time and experienced members of the team are always available to answer questions. Contact us today to discuss your requirements and arrange your free no obligation quotation.